A recent symposium cosponsored by the Strategic Studies Institute and the University of Kentucky's Patterson School of Diplomacy and International Commerce examined that grey area between war and peace, between intervention in support of national interests and humanitarian operations which, while necessary and appropriate, also put Americans in danger while consuming precious and ever scarcer resources. The following two papers from that symposium complement each other well. In the first, a revised after action report on his experiences in Somalia, Ambassador Robert B. Oakley, a career foreign service officer who served as Special Envoy to Somalia during both the present and previous administrations, provides an honest and compelling look at that controversial operation. In the second paper, Dr. David Tucker, who serves on the staff of the Assistant Secretary of Defense for Special Operations and Low Intensity Conflict, dissects the arguments to develop criteria which might be used for and against engagement in humanitarian operations in an attempt to guide U.S. policymakers. Ambassador Oakley and Dr. Tucker, while approaching their subjects in two very different ways, come to the same general conclusion. They both agree that the United States, as a great power, will be engaged in intervention operations of all kinds all over the world. Ambassador Oakley contends that much that was learned from our efforts in Somalia proved beneficial in later operations, specifically in Haiti and Bosnia. 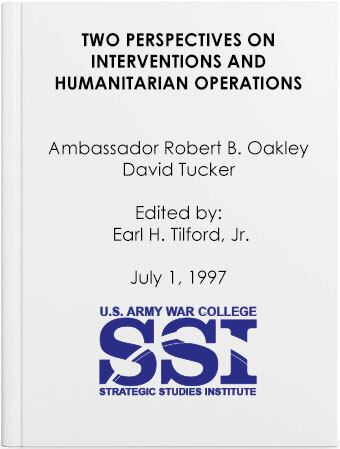 Dr. Tucker, while suggesting guidelines that may be useful in determining when, where, and how to commit American military and civilian personnel to relief and humanitarian operations, also makes the point that even the best criteria can promote, but not guarantee, successful outcomes. One thing is certain, these kinds of operations are with us to stay.